At the beginning of December 2017, the Delaware River Basin Commission (DRBC) issued a Notice of Proposed Rulemaking and Public Hearing that if adopted would prohibit hydraulic fracturing activities within the Delaware River basin. The rule would also strictly regulate and require DRBC approval for both the withdrawal of water from within the basin for hydraulic fracturing activities outside the basin and the treatment of oil and gas wastewaters within the basin. Hydraulic fracturing activities have been effectively prohibited in the basin since May of 2010, when the Commissioners voted to postpone any decisions on dockets related to hydraulic fracturing until the DRBC adopted corresponding regulations. The DRBC released a draft of regulations at the end of 2010, revised them in 2011, but eventually cancelled the meeting scheduled to vote on the rules. The DRBC had not revisited this issue until Fall 2017, when the Commissioners passed a resolution directing the DRBC staff to draft a rule prohibiting hydraulic fracturing activities within the region. Citing reports authored by the New York State Department of Environmental Conservation and the United States Environmental Protection Agency in 2016, the DRBC notice states that the use of hydraulic fracturing to extract natural gas from the Marcellus and Utica formations presents risks, vulnerabilities and impacts to the quality and quantity of surface and groundwater resources in the basin at each step of the “hydraulic fracturing water cycle.” Based on these risks, the DRBC not only prohibited hydraulic fracturing activities within the basin, but also required DRBC approval for the export of any water from the basin for use in hydraulic fracturing outside the basin, even if the withdrawal volume falls below the 100,000-gallon daily average that the DRBC has deemed to have no substantial effect under other circumstances. Furthermore, wastewater from oil and gas operations, called “produced water,” may not be treated within the basin unless the water meets certain standards applicable to produced water and the treatment receives prior approval from the DRBC. 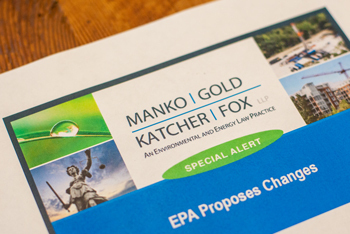 Public hearings on the proposed rule are scheduled for January 23 in Waymart, Pennsylvania, January 25 in Philadelphia, Pennsylvania, and February 22 in Schnecksville, Pennsylvania. The DRBC is also hosting a public hearing via phone on March 6. All public comments are due by March 30, 2018. Both industry representatives and landowner groups with pending lawsuits designed to force the DRBC to allow natural gas development have objected to the proposed rule as inconsistent with decades of experience with and studies concerning hydraulic fracturing. At the same time, environmental groups opposed to natural gas activities have expressed concern that the proposed rule raises the possibility of produced water treatment within the basin. As a result, even publication of a final rule after eight years of a de facto moratorium will probably not be the last word in 2018 on the future of natural gas activity in the basin.